This rich and invigorating book provides a much-needed argument for the place of poetry in 21st century English curriculum, and a grounded and practical resource for reading, teaching, writing, analysing, performing and making poetry. Bringing together academics, practicing poets and classroom teachers, it offers a set of nuanced and wide ranging reflections on the pragmatics and possibilities of teaching poetry and timely and sensitive instances of good pedagogy and responsive teaching in current times. It will be warmly welcomed by English and literacy teachers, academics and the profession alike. Most importantly, it provides real opportunities to make a difference; to enhance and open up the experience of literature in young people’s lives. – Catherine Beavis, Professor of Education, Griffith University, Australia. 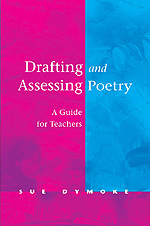 `Drafting and Assessing Poetry is thoroughly researched and shows how attitudes towards teaching of poetry and indeed the place of poetry on the syllabus, has changed with political fashion over the years., But more importantly, Sue Dymoke shows how a handful of contemporary poets go about drafting their work and sees this process as an essential tool in the classroom, advocating that students should keep drafting notebooks, just like real writers.